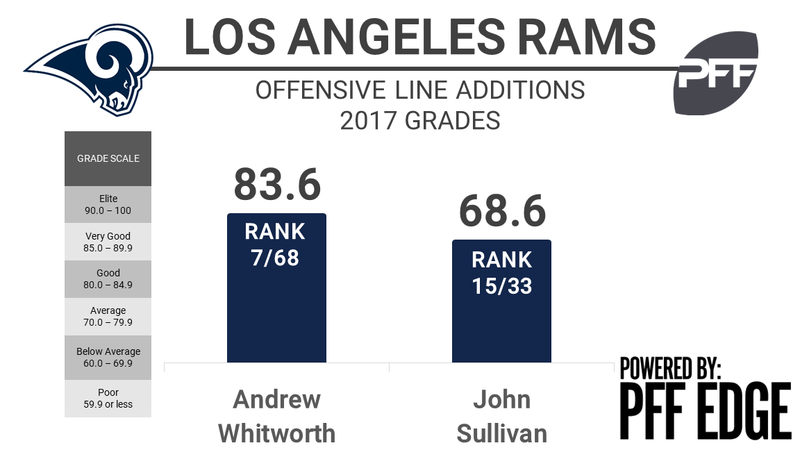 Through four weeks of the NFL season the Los Angeles Rams offense appears to be much improved and it’s no surprise that offseason additions to the offensive line in Andrew Whitworth and John Sullivan appear to be paying off. Whitworth has maintained his place as one of the top tackles in the league, ranking seventh with an overall grade of 83.6. As usual he has been solid as a run blocker (83.5 run block grade) but he has been near flawless in pass protection and boasts the top pass-blocking efficiency among tackles at 99.2. He has allowed just one pressure on 123 pass-block snaps. Sullivan currently ranks 15th among centers with an overall grade of 68.6. However, since a brutal Rams debut in which he earned a game grade of 40.4, he has been very good. This past week against the Cowboys Sullivan earned the fifth-highest grade among centers of the week with a game grade of 80.3.